MIAMI (Reuters) - Acting U.S. Defense Secretary Patrick Shanahan warned any nations contemplating anti-satellite (ASAT) weapons tests like the one India carried out on Wednesday that they risk making a "mess" in space because of debris fields they can leave behind. Speaking to reporters in Florida during a visit to the U.S. military's Southern Command, Shanahan said the United States was still studying the outcome of a missile India said it launched at one of its own satellites. "My message would be: We all live in space, let’s not make it a mess. Space should be a place where we can conduct business. Space is a place where people should have the freedom to operate," Shanahan said. Experts say that anti-satellite weapons that shatter their targets pose a space hazard by creating a cloud of fragments that can collide with other objects, potentially setting off a chain reaction of projectiles through Earth orbit. 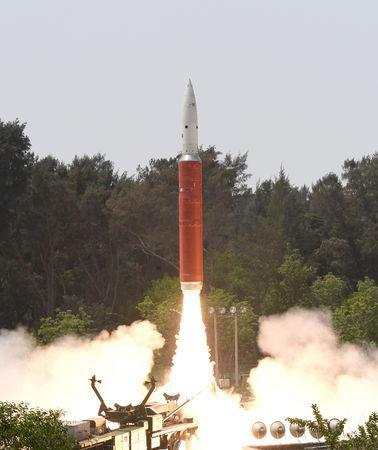 India's foreign ministry played down any risk of debris from its missile test on Wednesday, saying the impact occurred in low-Earth orbit and that the remnants would "decay and fall back on to the Earth within weeks." The U.S. military's Strategic Command was tracking more than 250 pieces of debris from India's missile test and would issue "close-approach notifications as required until the debris enters the Earth's atmosphere," Pentagon spokesman Lieutenant Colonel Dave Eastburn said. The New Delhi government and Washington, which have generally close relations, have been in talks regarding the event, and India publicly issued an aircraft safety advisory before the launch, Eastburn added. Lieutenant General David Thompson, vice commander of U.S. Air Force Space Command, added the International Space Station was not at risk at this point. NASA chief Jim Bridenstine said in testimony before the House Appropriations Committee on Wednesday that the consequences of anti-satellite weapons tests could be long-lasting. "If we wreck space, we're not getting it back," he said, without mentioning India by name. India would only be the fourth country to have used such an anti-satellite weapon after the United States, Russia and China, Prime Minister Narendra Modi said. The United States ran the first anti-satellite test in 1959, when satellites themselves were rare and new. Shanahan noted that given the increasing global reliance on space, it was important to create rules of the road for space. "I think not having rules of engagement is worrisome. So, how people test and develop technologies is important," he said, adding: "I would expect anyone who tests does not put at risk anyone else's assets."